Zhang Guoli (center) and Zhang Mo (far right) go Back to 1942. 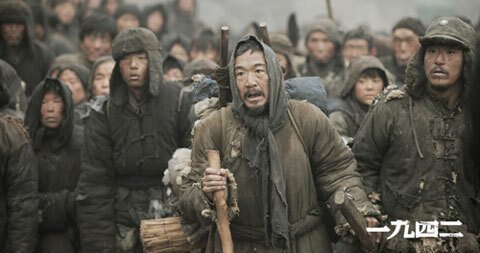 The Skinny: Punishing and admirable work from Feng Xiaogang about the 1942 Henan Famine in China. Instead of manipulative drama, Feng goes for a surprisingly ironic, even tragicomic tone. Worthy but understandably not for everyone. by Kozo: Feng Xiaogang does the big historical movie thing with Back to 1942, and naturally the film seems like a follow-up to his mega-acclaimed, mega-grossing Aftershock. However, Feng diverts from his previous effort, going less for tear-jerking drama and more for the kind of dry irony that made him China’s most successful comedy filmmaker. The move is good because Feng is much for suited for satire than earnest drama; as both a filmmaker and a person, Feng is too wickedly smart to consistently pander, and excels when taking the piss out of whatever it is he’s talking about. The problem: Back to 1942 is a movie about a deadly-serious famine and humor, dry or otherwise, is not a natural fit. Story first: Back to 1942 concerns the 1942 Henan Famine, when droughts, the Sino-Japanese War, government corruption and almost comical bureaucracy led to the deaths of over three million Chinese. At the time, Henan province was surrounded by encroaching Japanese, making famine relief difficult for the Nationalist Chinese government, while appointed bureaucrats began taxing the starving locals for more grain than they actually had. Amidst this backdrop, rich landowner Fan Dianyuan (Zhang Guoli) loses nearly everything when starving bandits burn his property to the ground and kill his son. When the drought continues and food becomes scarcer, Fan and family hit the road, joining a march of refugees seeking shelter in a neighboring province. Then things get worse. Fan’s story becomes one of human folly, with tragedies arriving one-by-one in frequently ironic fashion to demoralize the characters and the audience. While Fan and family struggle with poverty, starvation, theft, murder and possibly worse, the government stays incredibly aloof, first taking local grain to feed their troops and then abandoning Henan to the whims of the Japanese military. There’s gore and grisly stuff in the offing, with cannibalism hinted at, while the bureaucratic wrangling is depicted with occasional black humor. Despite the potential for tear-jerking moments, Feng keeps the audience at a curious distance. Many characters don’t engender sympathy, including ones that graphically suffer. Basically, it’s hard to feel for people when they’re portrayed as both victims and perpetrators. The strength of Back to 1942 lies in its willingness to indict the Chinese people in their own suffering. Fan and family are victims, but their obtuse selfishness causes as many problems as the circumstances surrounding them. Neighbors are not out to help each other and the government is more than willing to quietly look the other way. Opportunity makes devils of nearly everyone, but there are moments of sacrifice and humanity too. Feng doesn’t play up the tear-jerking moments as frequently as he did in Aftershock, making his perspective a bit difficult to discern. But the emotions, both sympathetic and sardonic, are there for people paying attention, and come off as less manipulative than what they could have been. Back to 1942 is a movie that demands a little extra effort from its audience. Besides the Chinese people, the Japanese end up looking pretty lousy too, so there’s still some nationalism. What’s somewhat surprising is the film’s treatment of Chiang Kai-Shek (Chen Dao-Ming), leader of the Nationalist government. The Henan Famine occurred under his watch — which is what skeptical China observers might point to as the reason that SARFT allowed a film about a China famine to even get made – but Chiang is portrayed as a pragmatic and compromised man, and not an ill-meaning or incompetent one. Chen is suitably circumspect in the role, and is not as sympathetic as Zhang Guoli’s take on Chiang Kai-Shek in The Founding of a Republic. Still, given the China-fluffing one expects from these big SARFT-approved epics, Back to 1942 is remarkably even-handed and also accomplished. The film addresses complex situations and emotions with appreciable intelligence and strong technical craft.